The Board of Directors of the California Indian Museum and Cultural Center are sponsoring three awards to be given at this year’s 10th Annual For All My Relations: Conference For Indian Families, at 11:30 on Thursday, July 9, 2009 at the Hyatt Regency Orange County, located at 11999 Harbor Boulevard, Garden Grove, CA, 92840. DOWNLOAD award guidelines and nomination forms PDF. We hope that you will take this opportunity to honor the achievements and contributions of individuals from your community. 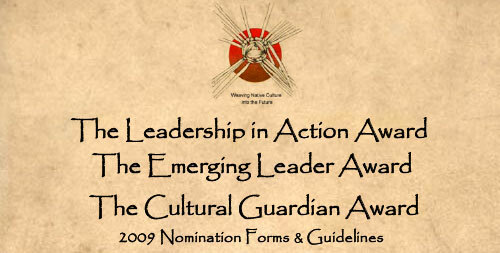 The Cultural Guardian Award recognizes an individual who has demonstrated a powerful commitment to protecting, preserving and enhancing the cultural integrity of Indian tribes of California. The recipient must have demonstrated a dedication to tribal language enhancement and preservation activities that assure an intergenerational connection to culture and tradition. The Leadership in Action Award recognizes a California Indian leader who has demonstrated a strong commitment, dedication and devotion to improving tribal governance and the community spirit of Indian country. The recipient must have demonstrated a genuine appreciation for the enhancement of tribal sovereignty, families and communities. The Emerging Leader Award recognizes a student who has demonstrated the ability to reach leadership potential through competitive achievement. The recipient must have demonstrated academic, athletic, and/or community service excellence and show commitment to using their skills to improve the well being of California tribal communities. The awardees will be honored at 11:30 on Thursday, July 9, 2009 at the Hyatt Regency Orange County, located at 11999 Harbor Boulevard, Garden Grove, California 92840. For additional information on the “For All My Relations” conference visit www.nijc.org. For information on the California Indian Museum and Cultural Center visit www.cimcc.org. Article submitted by Dr. Joely proudfit, Lusieño.